Amiea permanent makeup machines & accessories are masterpieces of German engineering, developed exclusively for Amiea by the worlds market leader in the manufacture of Digital Cosmetic Tattooing Machines. 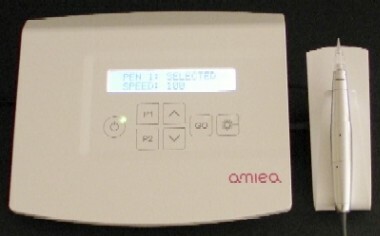 The Amiea Linelle Supreme is part of the next generation of Amiea Linelle Micropigmentation systems. Dedicated to make your work easier and your creations even more beautiful, Amiea have designed the Amiea Linelle Supreme to deliver the most reliable, high precision results. The same manufacturer also makes the nouveau contour machines, Amiea is the manufacturers private label and consequently their range offers the cutting edge in Cosmetic Tattooing products. This machine retails for AU$4,500 if you purchased from Europe so CT Shop is offering you a fantastic price. The ergonomically designed cosmetic pen with its easily adjustable needle depth feels like a natural extension of your hand and lets you work steadily and precisely. It is compatible with the full range of ingenious creatip cartridges hygienically sealed to avoid spills and backflows and available in numerous shapes and needle configurations for every application. The sleek, intuitive control unit with its digital controlled ensure stop precision and allows you to focus fully on your work. With its two interfaces, it can connect to two cosmetic pens simultaneously, letting you switch even more easily between different colours or needle configurations. Light and compact, the Amiea Linelle supreme operates with minimal noise and vibration, takes up little space, and is easily transported. 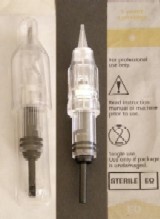 The creatip needle modules are incredible, no more mucking around with needles, tips, casings and transmissions shafts, creatip modules replace all those fiddly components with one single use sterile needle chamber that is completely separated from the hand piece to prevent flow back contamination. For safety when the machine is turned off the creatip needle automatically retracts thus helping to prevent needle stick injuries. • lightweight ergonomic pen - only 13.2 cm x 2.2 cm and 80 g! • high needle frequency 50-150 injections per second (increments of 5). • If you pay via direct deposit you will also receive a $20 gift certificate! NB. 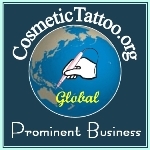 You must have already successfully completed a Cosmetic Tattooing course provided by a reputable trainer! • Additional 1 year warranty - 2 years total peace of mind (Just $99). • Additional ergonomic pen (hand piece) - So you easily switch to a second procedure on the same client. Minimum quantity for "Twist Cartridge for Symphony, Facile, Linelle 1 & 2 - 3-sloped" is 10. For Fine hairlines, Lip shadowing, eyebrow shadowing. Minimum quantity for "Twist Cartridge for Symphony, Facile, Linelle 1 & 2 - 4-flat" is 10. For Lip shadowing, full lips, eyebrows, full shadowing, areola, shadowing, scar camouflage. Minimum quantity for "Twist Cartridge for Symphony, Facile, Linelle 1 & 2 - 5-magnum" is 10. Minimum quantity for "Twist Cartridge for Symphony, Facile, Linelle 1 & 2 - 5-shader" is 10. Minimum quantity for "Twist Cartridge for Symphony, Facile, Linelle 1 & 2 - 5-sloped" is 10. For Lip shadowing, areola, scar camouflage. Minimum quantity for "Twist Cartridge for Symphony, Facile, Linelle 1 & 2 - 7-round" is 10. For Lips, areola, scar camouflage, full shadowing, eyebrows. Minimum quantity for "Twist Cartridge for Symphony, Facile, Linelle 1 & 2 - 9-magnum" is 10.